Jason at Signalsounds is a legend! that review is funny lol. You know you don’t have to use the presets, buddy…Plus it’s basically a Juno (with some bells and whistles)–one of the most straight forward synthesizers out there. Anyone know if it’s really that noisy, though? Also Model D and Neutrons for $225! Shop all things Sensel including the award winning product, The Sensel Morph. 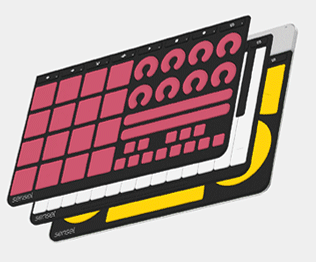 Shop from a variety of Overlays to use with the Morph for Music, Art, and more. Purchase this product to instantly download every Samples From Mars product in the store right now. Drum samples, synth samples and everything in between. Other collections are marked down, but the “all” bundle has the steepest discount. The Analog Four MkII is on sale for $1199 at many online retailers here in the USA. That’s $150 dollars off. Just grabbed this. Well happy about it. More quality drums samples than I could imagine. I notice the RYTM MkII is also on sale too. And Octatrack MkII and Digitone, and Digitakt and Analog Heat MkII. Here’s the rumor – Is Elektron going out of business??? ADDED: Joke! Here’s the rumor – Is Elektron going out of business??? at various online retailers. At least in the USA. EDIT: I’m also finding there’s no way to stretch the samples from the Atlas player. I suppose I could just drag them into my DAW, stretch them, then stick them back in. I feel this is a feature that could be added in an update! There’s the rub. Good to know they’re working on it. Think I’ll bite the bullet and buy the thing!